History of Jaipur dates back to 18th century, when the city was constructed. Read more about Legend of Jaipur, Rajasthan. Chittorgarh was the previous capital of the Rajput kingdom of Mewar. Maharana Udai Singh was a successor of the Sisodias, who claimed to be the descendants of the Sun God. The Sisodias are believed to be the oldest ruling family in the World. Amongst the warrior clans, Sisodias are recognized as the most powerful ones in Rajasthan. Another reason for shifting the capital from Chittorgarh to Udaipur was constant attacks of enemies. Udaipur continued to be the capital of Mewar, till it became the princely state of British India in 1818. When India got independent in 1947, the Maharaja of Udaipur granted the place to the Government of India. At that time, Mewar was merged into the state of Rajasthan. In the present date, Udaipur enjoys a favorable position on the maps of Rajasthan. 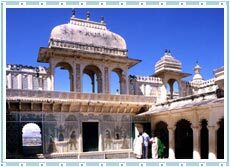 Udaipur is known for its picturesque surroundings and its royal past. Various ancient monuments, massive palaces, architectural temples and beautiful lakes fascinate people to visit the ancient land of the Royalty.